Ironclaw: Anthropomorphic Fantasy Role-Play has achieved platinum status on OneBookShelf.com! And several other titles have hit gold status. 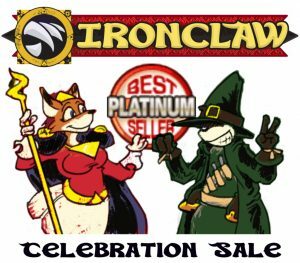 Celebrate with us like rock stars — all IRONCLAW titles are 33% off for the rest of March! If you’ve got holes in your collection, now’s the time to fill them. Come see what thousands of people have chosen for their fantasy game of choice! Play a character off the rack, or customize to your heart’s content with thousands of options from the savage to the scientific, from the magical to the martial arts, from the pagan to the ordained, from the noble to the outlaw. Ironclaw helps you and your fellow players work together to tell the story you want to tell. The Ironclaw Platinum Celebration ends when the fools show up and ruin everything, so tap here to get yours today. And to everyone who helped us get to where we are today, thank you for your support.